It takes time to find the perfect job, but you need money now—what can you do? The job search isn’t quick. Even if you know exactly what type of job you’re looking for, you still have to find an opening to apply for. Next is waiting to see if you get an interview and subsequently attending it. And finally, you wait once again to see if you got the job. That’s a lot of time spent waiting, not considering the hours you spend online or at professional events searching and networking. Trying to find a great full-time job is a job in and of itself. But one that pays absolutely nothing. And being unemployed doesn’t prevent your bills from piling up. Luckily, a great and flexible part-time job can be the perfect way to escape the job search for a bit, gain experience, and put money in your bank account. Here are our top choices. The service industry is always looking for applicants, partly due to many companies not paying a competitive wage. Although this can be hurtful for those wanting to work fulltime in the service industry, the lower wages can mean increased flexibility in a bid to attract applicants. For job seekers looking to earn some sort of income while they’re in the job market, this could be an ideal situation. If you’re good with your hands and looking for something on the industrial side, handyman work might be for you. The difference between being a handyman and a contractor is what is known as a “Minor Work Exemption” or “Handyman Exemption.” Although the particulars vary by state, the main takeaway is that small jobs that rise above a certain price point (or certain types of work) may require a license. Although it will be up to you to find clients, with handyman work, you can set your own hours, fitting in time to job search as needed. Admin and personal assistants are positions like cashiers in that they have fairly high turnover. However, they also can provide exposure to an industry you might be interested in. Looking for a marketing or PR position? Try to find an admin gig at an ad agency or marketing department. Is accounting or finance more your speed? Check and see if anybody is looking for a personal assistant in those departments. Most every department and business needs an administrative assistant. And if you have to take a part-time job to pay the bills while you’re looking for you dream job, why not choose something in a related industry? 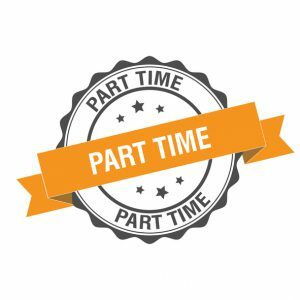 Not sure how to find any of those part-time jobs? At Express, we know that everyone’s job search is different. Some are looking for a career, while others just want something to pay the bills. Either way, whether it’s part time, full time, or something in between, we’re here to help. Check out our online office locator to find a location near you and schedule an in-person visit, or register online. Have you ever taken on a part-time job while you were job searching? What did you choose? Let us know in the comments below! My wife passed away last year, I resigned from my job as a CNA to care for her. I now work for walmart to make ends meet to pay my bills. Now, I am job searching to return to working as an CNA soon. I am interviewing for a full-time job that pays enough to support my mortgage. I never thought of part-time as a way to still have time to interview for full-time jobs. I have now applied for several “fun” part time jobs: golf course store, Starbucks, vet kennel help… thanks! No problem Susie! And thank you for keeping up with our blog! I’m an Accountant and While recovering from a stroke I have take several part time positions, I have worked as a CNA, taxpreparer, electrician assistant and now as a cashier at a gas station retail store. I’m desperate to return to full time employment within my chosen field as much as I enjoy the reduced workload and flexible schedule. The bills still aren’t getting all met!